Headlines that told of a short but terrific fight between Errol Flynn and Aiden Roark, polo player and studio executive, are scarcely dry when Flynn returns to work on his new picture, Dodge City. And oddly enough, his first scene requires him to leap out of a barber’s chair and slug Douglas Fowley. Several times director Michael Curtiz films the scene but Flynn makes his pulled punches look bad. Finally Curtiz becomes exasperated. “Hit him like the newspapers said you hit Roark, ” he demands. Flynn grins and in the next “take” he makes his pulled punch look like the real thing, and Fowley sails back on a pile of mattresses laid out to break his fall. * Douglas Fowley was a long-time movie and tv bad guy, as well as the father of hyper-wacko Kim “Alley Oop” Fowley. To our EFB Flynnmate Jack Marino, Writer & Director of FORGOTTEN HEROES, a magnificent tribute to veterans, and (at least to my knowledge) the only war film ever made with scenes filmed at Mulholland Farm. Mail Bag! French Curtiz Bio & Film Book! For all those who love Curtiz and read French, I found this book. He presents an excellent biography and analyzes each of his films including his pre-Hollywood production. The Most Underated Director in the History of Hollywood? What was his Greatest Film? Who were his Greatest Stars? The Adventures of Robin Hood swoops into the Billy Wilder Theater to restore a measure of innocence to the jaded moviegoer. Splendidly operatic in style and resplendent in its Technicolor trappings, the film endeared Errol Flynn to a Depression-era audience and secured his place in the Hollywood pantheon. Director Michael Curtiz replaced William Keighley when Warner Bros. decided that the action needed more oomph, and the film certainly doesn’t lack for excitement, particularly during the climactic swordfight with Basil Rathbone. UCLA Film & Television Archive is pairing it with Flynn’s American debut, The Case of the Curious Bride, as part of its tribute to Curtiz. Alan K. Rode will sign copies of his new Curtiz biography in the lobby prior to the screening. UCLA’s Billy Wilder Theater, 10899 Wilshire Blvd., Westwood; Fri., March 9, 7:30 p.m.; $10. (310) 206-8013, cinema.ucla.edu…. It’s 3/3, Baseball Spring. So here’s a FlynnQuiz involving the most famous No. 3 of all, Babe Ruth. One was Ruthian, the other Errolympian. Both were hugely popular and beloved stars, and still are. One’s career ended in 1935, the other’s exploded in 1935. What famous director did both Errol Flynn and Babe Ruth work with? Pitch No. 1: It involved a very big and famous premier in New York. Pitch No. 2: It did not involve the wonderful Harold Lloyd film depicted below. Pitch No. 3: Nor did it involve the Gary Cooper and Teresa Wright masterpiece depicted below. Speedy: One of Harold Lloyd’s greatest, featuring Babe Ruth. 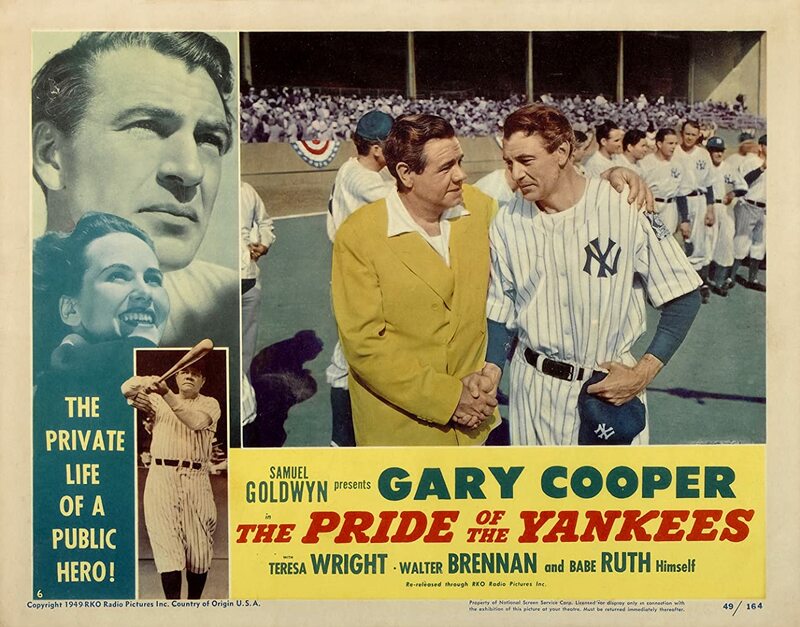 Pride of the Yankees: a heart-wrenching Super-Duper Gary Cooper movie, featuring the stunningly gorgeous and talented Teresa Wright. Look for Ruth in the beginning of this music video tribute. And here is another baseball rarity!